Welcome to X-hax, the place to go to for information on everything Sonic Adventure DX. 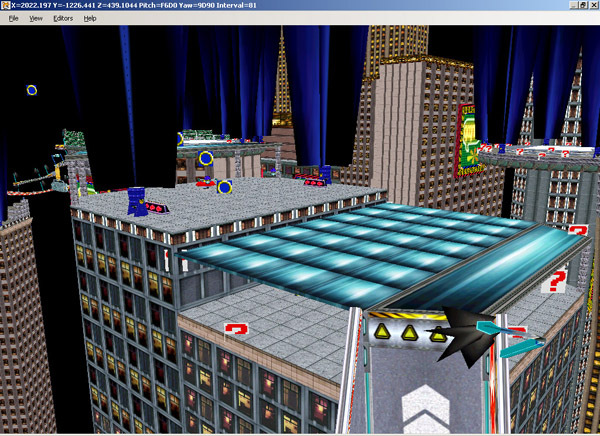 Home of Sonic Adventure RDX, and the defunct Shadow Adventure, you can find level editing tutorials and custom utilities for making Sonic Adventure mods / hacks here. Dude - 01/24/2011 - An update to PieChart brings the version number up to 0.8, and adds numerous features such as boss ghosts, 2 player mode and 21 levels in total! 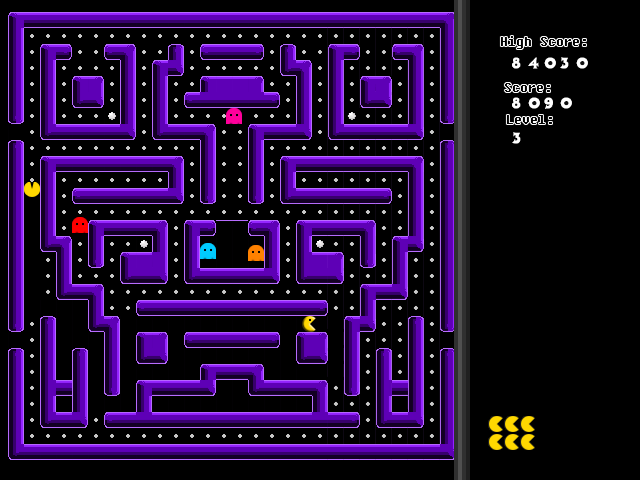 screenshot of 2p mode. Go ahead and download it over on the hacks/homebrew page. Dude - 11/14/2010 - I've been completely swept off of my feet with how fun homebrew programming for the Wii is, and I've spent the past few weeks working on PieChart. I'm hosting it here so everyone can play it. All you need is a soft-modded wii and Homebrew Channel or some other elf/dol loading system. Grab it on the hacks/homebrew page from the side bar. "Remember how in Collision Chaos you have those massive half pipes with those Slicer guys hanging around the bottom? And you spend ages getting massive air then those guys and their stupid blades screw you up? So you kill one and finally get the real air going, then think of how cool it is to drop into the next halfpipe and plummet right down that one.... until the next Slicer ****s you up again. Or how you could grab the powersneakers in Emerald Hill act 1, then roll up the quarterpipe, pop the invincibility and get this massive flight across the level only to crack a Buzz Bomber out of nowhere right on the head, and literally sail for miles again across blatant chunks of the entire level. Or how you could use the watershield's free downwards speed and abuse the weak deceleration of being underwater and set up these ginormous rebounds underwater that often saw you running out of water before you ran out of upwards motion. Or how you'd be screaming along somewhere, afraid to run because you're vulnerable but afraid to roll because you know it's going to stuff you up when you need to jump. Or how you could abuse a loop's curve by jumping off the ceiling, hitting the exit and watching your speed kick up another notch. Or how you'd start Icecap act 2 by tearing down that first hill in a ball, flying miles up into the air off the quarterpipe, then falling... and cracking the frozen lightning shield perfectly, bouncing miles up into the air again... and falling... then smacking the Orbinaut guy you've been aiming for from the start, bouncing miles up into the air again, and then continuing along the top route. Or setting up some massive jump you think you can do, finding a nice hill to get your run up, dashing down it, rolling, hitting that little planned bump perfectly, soaring into the air..... and massively overshooting your mark helplessly. Yeah none of that is possible in Sonic 4. God it brings back the memories." What makes this so much more of a slap in the face is this video that shows what Sonic 4 could have been like, given a full retail budget and pixel-perfect physics recreation. Imagine this style game with "new" levels (All of the content in Sonic 4 so far is re-hashed, which isn't too bad I guess) and SEGA expects us to buy this? Of all of the things they could have rehashed, why not the gameplay? Why did they start with the visuals instead? This is all pretty damning, but it is not all doom and gloom for SEGA, as they've made the absolutely unprecedented move of actually DELAYING a sonic game instead of doing the opposite by rushing it out the door. More than that even, they actually FIXED some things in the meantime, another shocker, by removing the much hated motion control minecart gimmick from the leaked build and re-doing some of the level design for Lost Labryinth Zone. Each update from them does actually bring some improvements. And not to mention the fact that they realized making a new 2d sonic game is a good idea is also a huge step in the right direction. Given how long it takes for a Quality Assurance team to asses each new build of a game, I doubt they'll have enough time to fix the horribly broken game engine before the rumored November release date. As a Sonic fan, I have to say the worst part about this whole ordeal is that I know SEGA won't make another 2d sonic game if this bombs, but if this sells millions they will assume nothing is wrong with it and keep the broken engine and autoplay 'features' and then screatch their heads at all of the complaints coming in. Please SEGA, fix this. You have all of the resources and know-how you could possibly need. MainMemory has released the latest version of SADXLVL which now supports SET editing with 3d model representations. This allows for complete accuracy and precision while working on your object layouts! Level editing is easier than ever as you can now see exactly what your layout is going to look like ingame. 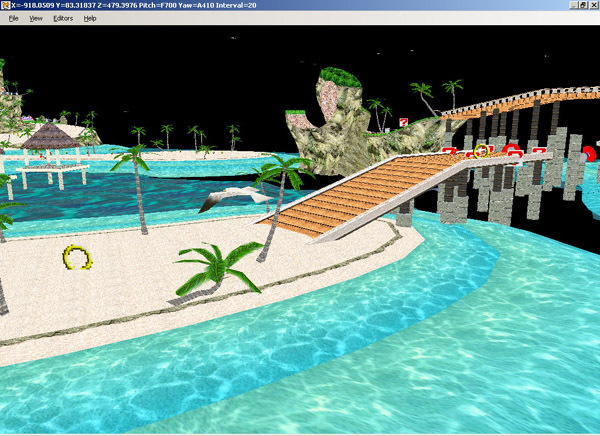 So far, only speed highway and emerald coast objects are supported. More coming soon! I forgot to update the tutorial index with my latest level editing tutorial. This tutorial uses 3dsmax and SADXLVL, with minimal hex editing involved for complete level edits! 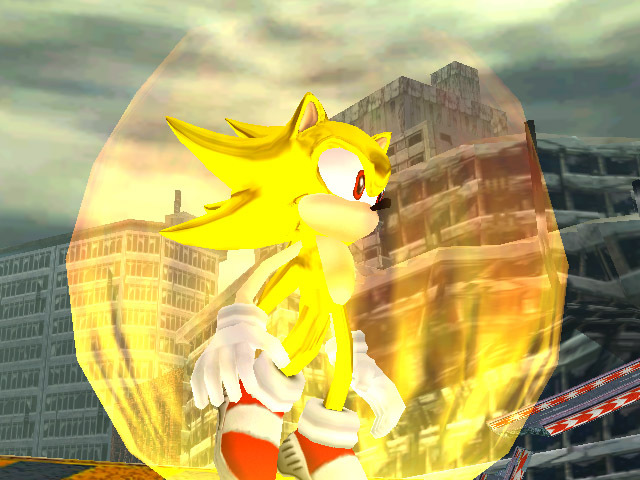 Also, Endri has asked me to host his super sonic hack here and I have happily obliged. It is downloadable on the hacks page now. Don't forget to enter your hacks in the Annual Retro Hacking Contest! A new tutorial by CarrierHack is now available in the tutorials section. This tutorial explains how to turn a model into free space in sonic.exe, so you can replace it with something else. For a long time, people have been plauged by a bug in SADX that causes the c-stick to continually stick to one side when using a xbox 360 or gamecube controller in sadxpc. You can now download a fix for that in the hacks section. Important update to the level design contest rules for entrants. Click Here for details. You still have until late summer to finish your level, so design away! Don't be afraid to ask for help on the forum or post your progress. For a long time now I've been doing things the hard way in terms of hacking. I need a C programmer to help me finish my work on model and level tools. So please, if you are a competent C programmer, like sonic and know how to work with triangle strips and UI, contact me to become the next major team member! Also, with the arrival of MainMemory's sadxlvl, a whole new field of sadx level editing has opened up, and in celebration of that I'm going to be holding a level design competition. 1st place gets their level in Sonic RDX. Click here for Details! 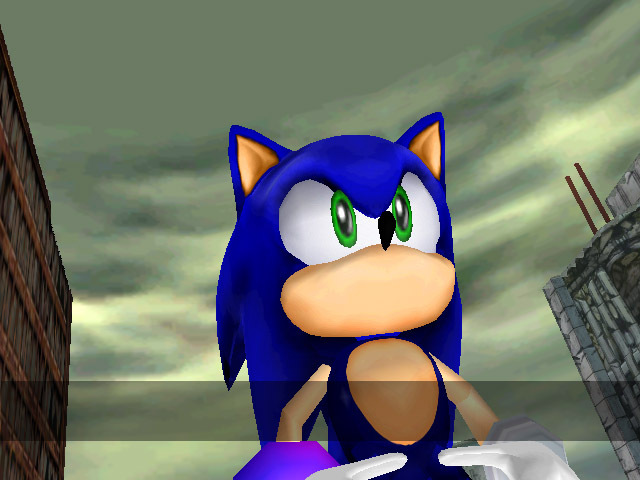 I probably should have mentioned this before but MainMemory has his own site now, with wonderful things such as SETEdit and SADXLVL that improve the workflow for sadx modders. You can find a link on the links page or by clicking here. Discussion of MainMemory's tools or hacks can be posted on the x-hax forums, he'll see them there. The Sonic the Hedgehog Hacking Contest 2010 has been announced this year over at Sonic Retro. This year marks a new turning point, as the 3d sonic games will now have their own category as opposed to competing with all of the hacks involved, as in previous years. Ayla is again organizing the event and needs contributors. I ask everyone in the sadx community to start a hacking project for the contest. The deadline is July 2010! Did more of that promised site update. Added a new hack, dreamcast model ports. Also, added over 40 screenshots of rdx, a new video and a camera editing tutorial. Remember to register at the forums! Doing a little site update, going to add new screenshots and a download link for RDX as well as a page on level editing. 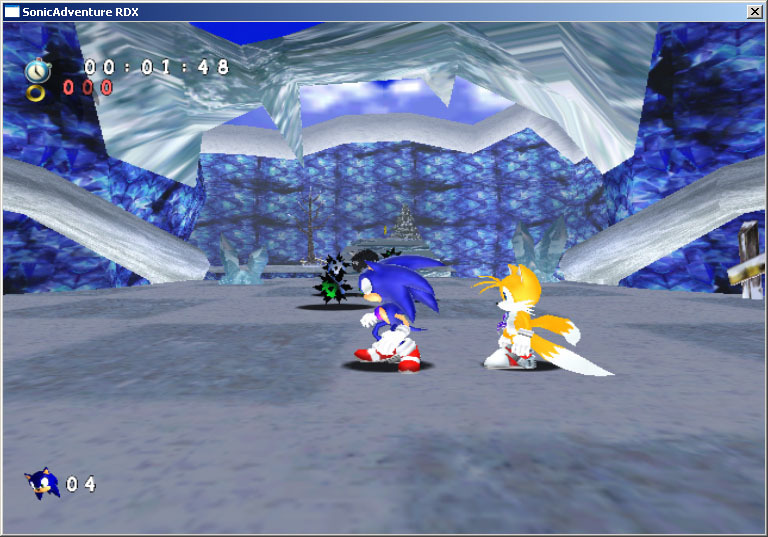 Sonic RDX Demo 2 is out. Download it. The new X-Hax Forums are open now! We're still around. Updated various things around the site, including a brand new Sonic Adventure RDX section. Check it out. Aaaaand we're up. Nothing really interesting to report, but whatever.